Drew Brees has become the NFL's all-time leader in yards passing — and he did it in style. Drew Brees became the NFL's all-time leader in yards passing — and he did it with a certain panache and precision that made the 39-year-old quarterback look far from finished. Brees eclipsed Peyton Manning's previous record of 71,940 yards with a 62-yard touchdown pass to rookie Tre'Quan Smith during the second quarter of a 43-19 victory over the Washington Redskins on Monday night. "Just so grateful for the opportunity to play this game and to have played it so long and to have the teammates that I have, and the New Orleans Saints organization, and this great city and this great fan base. It's just truly been a dream come true," Brees said. "I'll be able to reflect on it maybe a little bit more when my career is done. I still feel like there's work to be done." After the record-breaking completion, officials stopped the game and the game ball was handed over to Pro Football Hall of Fame officials on the sideline while the Superdome crowd offered a standing ovation. Brees removed his helmet, held out his arm to salute the crowd and hugged his wife, Brittany, and children on the sideline. Brees entered the game needing 201 yards for the record. He had 250 by halftime. Brees, who already holds the single-season record for completion rate at 72 per cent last season, finished the game a remarkable 26 of 29 for 363 yards, no interceptions and three touchdowns — two of them going to Smith, a third-round draft choice out of Central Florida has played just five NFL games and is now immortalized because of his role in Brees' record-breaking pass. In a victory at Atlanta earlier this season, Brees broke Brett Favre's career record of 6,300 completions. Brees still needs 41 touchdown passes to surpass Manning's record of 539, something the Saints quarterback could achieve next season if he maintains his current level of play. But Brees also would have to outpace New England's Tom Brady, who has 500 TD passes, the only active player with more than Brees in that category. Brees now has 499. Manning, a New Orleans native whose father, Archie, starred for the Saints, could not attend the game because of a scheduling conflict. However, he had pre-recorded a congratulatory message played on the Superdome's video boards. Shown on the video slicing tomatoes, Manning deadpanned that his time as the career yards passing leader have been "the greatest thousand days of my life." "Thanks to you, that's over now," Manning continued as the laughter erupted in the stands. "You've ruined that for me." "Also, let this serve as the congratulations for the touchdown record because as you can see, I'm very busy," Manning added. "I don't have time to keep doing these videos for you." On a more serious note, Manning said Brees broke the record "the right way." "All your hard work and dedication have paid off," Manning said while holding up a photo of himself and Brees standing side-by-side in 2000, when Brees was still at Purdue and Manning was a third-year pro. "You and I have come a long way since this picture." Next stop: Hall of Fame? Saints officials said Brees also would hand his uniform over to the Hall of Fame after the game. Brees is in his 18th season out of Purdue. The San Diego Chargers took the 6-foot Brees at the beginning of the second round of the 2001 draft, but allowed him to leave in free agency after a major throwing shoulder injury at the end of the 2005 season. The Saints, at coach Sean Payton's insistence, took a chance on Brees in 2006, and the payoff has been extraordinary. 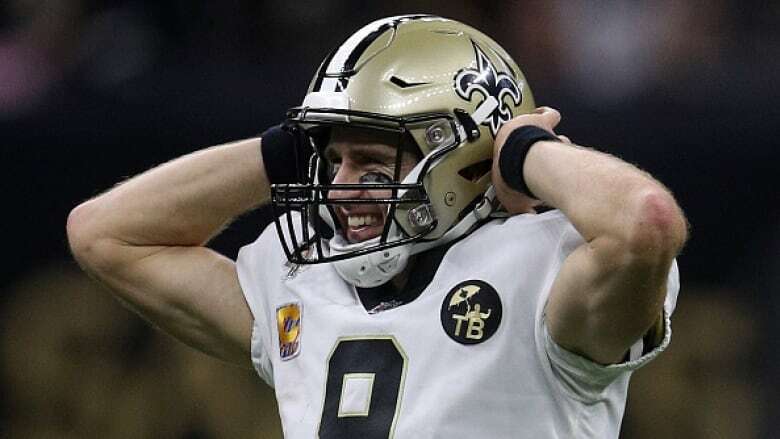 Brees has passed for more than 59,000 yards and more than 400 TDs in 12-plus seasons for New Orleans, smashing every meaningful Saints passing record while helping long-frustrated franchise win its first Super Bowl in 2010 and go to the playoffs six times. With the game in hand, Payton subbed Brees off the field after the two-minute warning so the quarterback could have one more interaction with the appreciative crowd. "He deserves it. It's been an unbelievable run," Payton said. "It doesn't feel like it's been 13 years." In 2012, Brees also set the NFL record for consecutive games with a touchdown pass at 54. Brees surpassed Hall-of-Famer Johnny Unitas' streak of 47 straight — which had stood since 1960. Former Saints receiver Devery Henderson, who caught the pass on which Brees broke Unitas' mark, attended Monday night's game. The game featured other touches meant to honour Brees. In the press box, the Superdome catering staff served "beefy mac," a meal of macaroni with ground beef that has long been one of Brees' traditional meals on the night before games. Brees also was the final Saints player to run onto the field during pre-game introductions as fans belted out elongated howls of "Dreeeeeeew."